Over at A Mountain of Crushed Ice, Tiare had a contest to name her drink. As I always have a hard time naming my own drinks, I was thrilled when she liked my name. Especially since the prize was a bottle of Swedish punsch! Swedish punsch is one of those ingredients that’s near mythological here in the United States. While it’s common in Sweden, it has not been available for a long time in the US. One of its major ingredients, Batavia Arrack, is now being imported by Haus Alpenz, and there are now many recipes to make your own punsch. And in the near future, we may be able to buy one brand, Facile. In the meantime, I’ve never had the chance to try Swedish punsch, or any of the classic cocktails that call for it, so I was delighted when the package arrived today: my very own bottle of Carlshamns Flaggpunsch. Opening the bottle and pouring a very small amount into a glass, I noticed that the smell is politely spicy. On my first taste, there is a dominant sweetness. Once you let it coat your tongue, a parade of flavors come out. The tea is quite noticeable. But after my one sip of Batavia arrack straight, it didn’t have the same long, bitter aftertaste I associate with this key ingredient in punsch. As I was hoping, this tastes somewhat like a spicy daiquiri. The tea flavor is what I notice the most. Something that would be nice to drink on the odd occasion to keep the taste buds at attention. Shake over ice, strain into cocktail glass, garnish with orange twist. On initial taste, I think 3/4 oz lime juice was a tad too much. I added 1/4 ounce agave nectar and that added a nice body to the drink. Next time I’ll probably cut back on the lime juice. That said, I really like this cocktail. The sloe gin and Swedish punsch blend well together. The punsch does provide an interesting aftertaste; this might work better as a digestif than an apéritif. “Politely spicy.” I love it. Can we see more Swedish Punsch recipes? Mabel Berra does sound interesting. 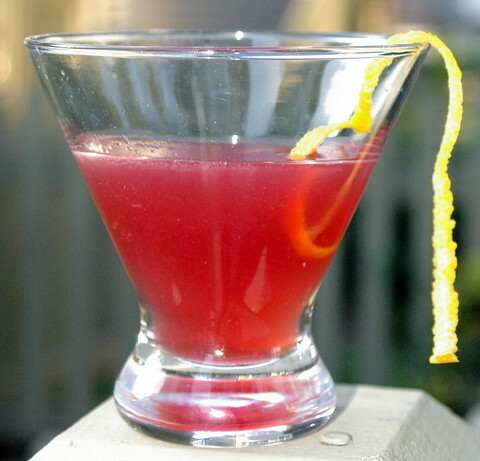 It’s not a Savoy Cocktail, but it does appear in the original version of Patrick Gavin Duffy’s “Official Mixer’s Manual”. Which seems fairly sensible, if a bit rich. Oh and that’s interesting about the Facile Punch. It’s my favorite of the commercial punches I’ve tried. I`m happy you got the punsch Stevi! Nice cocktail you made, i`ll try it. Facile is not sold in the spirit shop here but can be special ordered.In the shop we have the Flaggpunsch and Gronstedts. can you buy flagg punsch in norway?? ?Is it available in the usa now??? Hey, Flaggpunch must be 1) heated in boiling water until 92 degrees of celsius or 2) freezed as cold as your freezer gets- even better if there’s some nice nordic standadr -30 C outside. Please do not waste good Carlshamns Flaggpunch by drinking it at room temperature or mixing it up with abythong else nyt pea soup! on my behalf, heating in boilimg water is strongly recommended, altough delicate process. 1) remove the cork! Closed bottle with a very small air didplscement makes perfect grenade if placed in boiling water. Glass shraplnells an boiling water sprayin along in your kitchen- so not. Open the bottle and remove cork compeletely, please. 2) Heating must happen gently. Start placing room temperate bottle in the kettle full of cold water and rise temperature very slowly and gently. If done right, you should see a lot of sweat -or condenced humility- inside the bottle before the water in the kettle starts to boil. 3) in any case, do not boil punch! OMG, that boils alcohol away! just over 90, necause alcohol starts boiling a bit before water. 4) Microwave? Yack! DO NOT EVEN THINK. Better even at rooms temperature. Microwave generates very hot spots in the fluid and very uneven warming, that ruins Flaggpunch compeletely. Yot can try of course, nut ion the case please remember- your sloppinens in not fault of the punch. Swedish Citizen, but lived here in the US for c:a 50 yrs. Always cook my good old Swedish Food, the way my Mamma taught me.. Today, I made Swedish Yellow “Artsoppa”. A tradition in Every Swedish household, on Thursdays. NOT in the Summertime though.. then for Desert, we make Plattar, or Thin Pannkakor, med Lingon. The Topp, is to have some Swedish Flaggpunch, to go with. Happened to still have some, from My last trip home. OH, what a delicious meal!!!!! 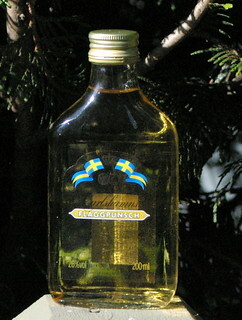 Where can I buy some Original Swedish flaggpunch, here in the States>>> Margareta in NH.